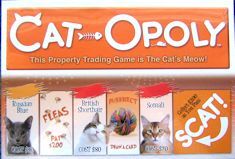 This is a favorite board game for cat lovers. You buy your favorite cats, collect litter boxes and trade them for fish bones. Cat pieces include a can of sardines, a mouse, a can of cat food, milk bottle, ball of yarn and a fish. Game comes with dice, cat breed cards, cat action cards and the Catopoly game board.